November 2018 - Maison Mumm is to take part in the most prestigious sporting events in the world by partnering with the 36th America’s Cup presented by Prada. The legendary sailing competition will take place on the Waitemata Harbour and Hauraki Gulf in Auckland, New Zealand, in 2021. 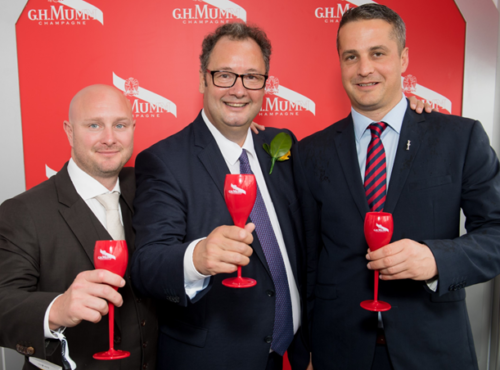 It is an opportunity for Maison Mumm to renew its long-standing commitment to sailing and to embrace the values that connect it to sport in general. 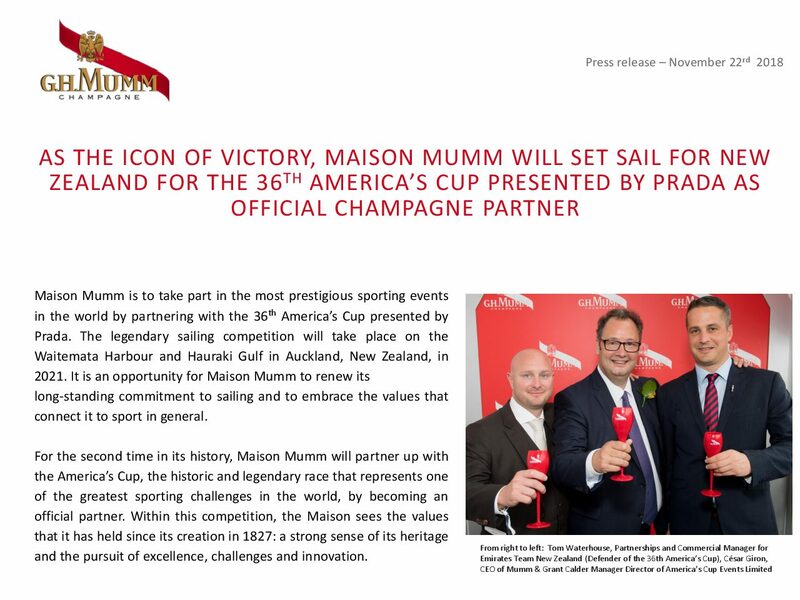 For the second time in its history, Maison Mumm will partner up with the America’s Cup, the historic and legendary race that represents one of the greatest sporting challenges in the world, by becoming an official partner. Within this competition, the Maison sees the values that it has held since its creation in 1827: a strong sense of its heritage and the pursuit of excellence, challenges and innovation. Maison Mumm has a long history of affiliation with sport. It embraces new ventures, including technological innovations, and values above all having the courage to challenge yourself. Maison Mumm encourages everybody to live their lives with passion, to push the boundaries and dare to celebrate their victories. 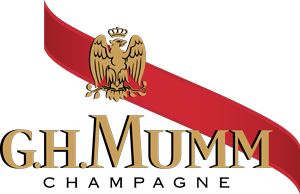 One of the best illustrations of this commitment is the interest that Maison Mumm took in sailing in the 1970s. Since then, it has supported more than 40 of the sport’s major competitions, such as the Vendée Globe, the Route du Rhum and the Jules Verne Trophy – and not forgetting the 25th edition of the America’s Cup in 1983. As an icon of victory, the Maison has joined numerous navigators onto the podium, like François Gabart and Armel Le Cléach, winners of the Vendée Globe in 2013 and 2017, respectively, and record-breaking solo sailors Ellen MacArthur, who toured the world in 2005, and Thomas Coville, who completed his tour in 2016. As the Official Champagne Partner, Maison Mumm will be present at all America’s Cup events including the America’s Cup World Series and Prada Cup, for moments of celebration at the height of each event. Until then, Maison Mumm remembers its core belief and reminds everyone that the most beautiful victories are not those where we hold others back, but where we push ourselves further.